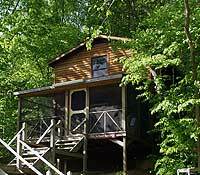 Each of our Jacuzzi Cabins offer the ultimate in solitude and privacy, and overlook the White Oaks meadow. In a separate area of White Oaks, our Hansel & Gretel features an all new outdoor hot tub surrounded by forest. 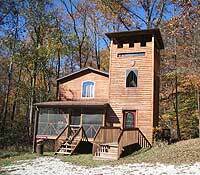 Featuring two bedrooms, a fireplace, Jacuzzi, outdoor hot tub, 35' tower, and more... The Castle is in a class all its own. Visit it's own page to learn more. 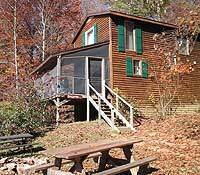 Our "Hilton in the Woods" sleeps up to six comfortably and features two bedrooms, flat screen TV (local channels), fireplace, and jacuzzi. 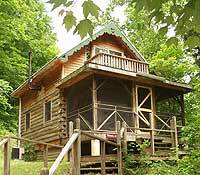 You will find this cabin "Absolutely Magical" with comfortable sleeping for up to six and featuring two bedrooms, flat screen TV (local channels), fireplace, and jacuzzi. 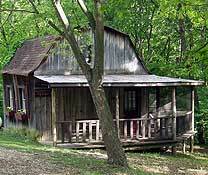 This cabin is for adults only. No smoking is allowed indoors.